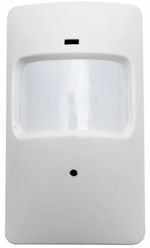 The Alarm Sensor Covert Camera covertly houses a DVR inside what looks like a home security infrared detector unit. Expand your home security with a device that not only detects someone is there, but records them so you can see and show exactly who it was and what they were doing. Motion activation. The motion activation feature allows you to only capture video during the action and preventing you wasting hours sifting through footage of a silent empty area. Auto overwrite. Great for long duration surveillance needs, if the SD card becomes full, older files are automatically replaced by newer ones, thus removing the need for manually deleting innocuous footage. Remote control operation. 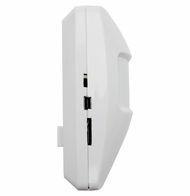 Manually control the DVR from up to 30 feet away. This way, you don't need to draw extra attention to the device by walking right up to it. Removable SD card storage. This device can support up to 32GB SD Cards.